I remember there was nothing more fun growing up as a kid than playing tag in the backyard or building forts and having pretend gun battles with siblings or neighbors. 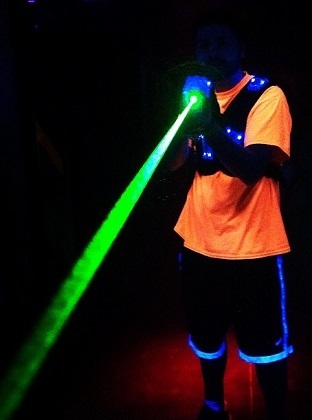 Fast forward many years and an indoor destination in Avon has combined the two to create an amazing laser tag experience that is like stepping into a video game. Oh, to be a kid again! If you&apos;re looking for an activity for your kids that&apos;s fun, entertaining and a great way to burn off some energy, you&apos;ll want to head over to Xtreme Lazer Tag in Avon. For our family and a lot of our friends, we&apos;ve got mostly teenage boys and girls and we&apos;re always looking for activities for those times when the weather isn&apos;t so good outside or to celebrate a birthday or other special occasions, and Xtreme Lazer Tag provides a perfect option. Located at 8131 Kingston St., Suite 100 in Avon, the family-owned and operated facility offers a 4,000 square-foot, multi-level, black-light play arena with a cool, space-age atmosphere that provides plenty of room to play some games and battle it out. One of the things I like about Xtreme Lazer is they have some of the newest technology and equipment to play with and they have recently added programs that make it possible for you to play games such as "Capture the Flag" while you&apos;re there. 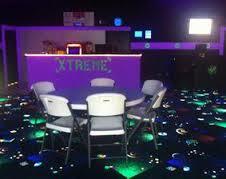 They also offer special deals every weekend including unlimited laser tag as part of their "Friday Night Frenzy." For $20, you get to play all you want from 9 p.m. to midnight, and they include a free soft drink. On Saturday, their "Saturday Morning Blitz" includes unlimited laser tag from 10 a.m. until 1 p.m. and a soft drink for $20. Finally, Xtreme Lazer Tag&apos;s "Sunday Special" lives up to its name as you can play four games for $20. Their regular rates are: $8 for 1 game, $15 for 2 and $19 for 3. But, they also offer other specials that make it nice for bigger families or groups. Xtreme Lazer Tag is open from 4-9 p.m. each Thursday, 4 p.m.-midnight on Fridays; 10 a.m.-11 p.m. on Saturdays and 1-7 p.m. on Sundays. It&apos;s family-friendly and in addition to the lazer tag, there are lots of arcade games and a concession stand with a nice selection of affordable food and drink options. For birthdays, Xtreme Lazer Tag makes it easy, with a complete package. It&apos;s a two-hour event, and you can reserve a table for 90 minutes. You&apos;ll receive 3 games and each player will get free unlimited soft drinks. The packages also includes 30 cupcakes. You can even order large 1-topping pizzas for $10. And, just to make sure you have everything you need, they provide you with a party host. What more can you want? Help with the party and you don&apos;t have to worry about the mess. For parties up to 8 people, it&apos;s $175 and $17.50 for each additional guest. They also offer group rates and deals for church group lock-ins. If you&apos;re group is really big and you&apos;d like the place all to yourself, Xtreme Lazer Tag will work with you on rates for an exclusive private party. All in all, it&apos;s a great place and one that I&apos;ll keep on the list when I&apos;m looking for something fun for the kids that they&apos;ll enjoy...and that wears them out.